CCF Nepal Quake Update #01 – A powerful 7.8 magnitude earthquake struck Nepal on 25 April 2015, and triggered a deadly avalanche on Mount Everest and landslides in the Langtang valley region, burying homes and damaging historic landmarks and public infrastructures. More than eight million people are affected across the 39 districts of Nepal, including the cities of Kathmandu and Bharatpur, and the neighbouring regions of India, with nearly 2.8 million displaced and 5,000 lives perished. Poor sanitation and hygiene due to ‎lack of clean water has seen a sharp increase in dysentery cases. Further loss of fluid due to dysentery, exacerbates dehydration and loss of energy amongst the survivors, increasing their vulnerability to illnesses and diseases.‎ ‎Upper respiratory infection (URTI) cases are also on a rapid rise. Medicines including painkillers, antibiotics and anti-diarrhoea are urgently required. The ground evaluation was made by Singapore’s Corporate Citizen Foundation’s SEED (Swift Emergency Evaluation Deployment) team which spent 5 days in Nepal following the devastating earthquake that has so far killed more than 7000 lives. Following up on SEED’s assessments, the CCF had joined hands with a local Nepalese corporate hospitality group, Annapurna Hotel, last Thursday to establish a clean water distribution net‎work for the quake victims around the hilly outskirts of Kathmandu‎. (left) Annapurna Hotel staff providing their step prowess on the StepPure ultra-filtration system to churn clean water into large urns on vehicles for distribution to the survivors at the outskirts of Kathmandu. (centre) Water distribution team arrived at the hilly area in Kapan, where 35 orphans and their caregivers stayed outdoors in makeshift tents and darkness, as cracks were left in their orphanage by the original quake. (right) CCF’s Programme Lead, Wang Zhenwei, made friends with one of the orphans in Kapan as Annapurna Hotel staff completed the water transfers. The SEED team arrived in Kathmandu last Monday to address areas of acute and critical needs; make early and accurate assessments of the ground situation, and disseminate the evaluated findings. It brought along 100 body bags, 10 foldable stretchers and 2 units of StepPure. It had collaborated with the local Armed Police Force (APF) and provided the APF with one of its manual-powered StepPure ultra-filtration units to serve the water needs of the survivors within Kathmandu. The StepPure, comprising membrane and carbon filters, churns a minimum of 1200 litres of clean water per hour. Setting up the StepPure unit at the Armed Police Force (APF) headquarters to train the APF personnel on the use and maintenance of the StepPure, manufactured by SEED’s partner, Golden Season. (left) CCF’s Technical Adviser, Hassan Ahmad, unpacking body bags and stretchers for handover to APF’s DSP Jeevan KC at the APF HQ, witnessed by local senior Rotarians. (right) Miss Nepal 2012, Shristi Shrestha, joined the SEED team’s assessment visit to a displaced persons camp where she mingled with the quake survivors. The SEED team, led by experienced humanitarians from HSL, and through its reputable media partner, Mediacorp, broadcasted real-time information and images daily from the affected grounds to the regional community, as the team roved between several grounds zero to personally distribute body bags to operating SAR units. 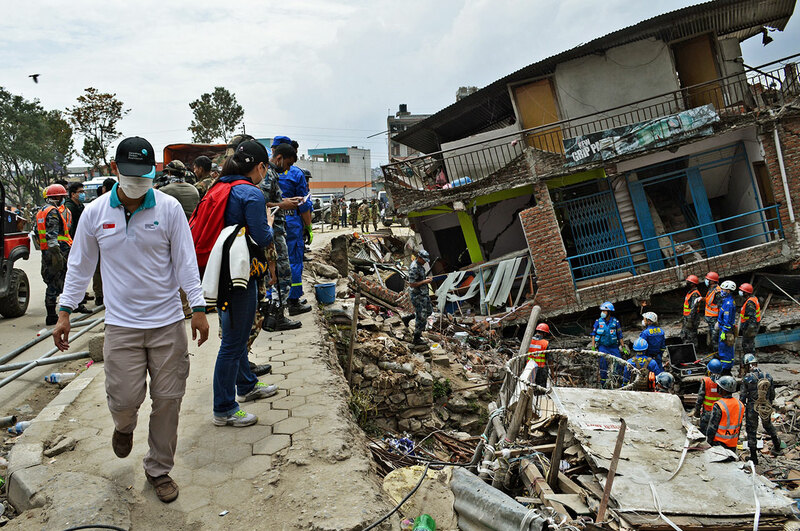 The SEED team arrived at one of the grounds zero near the Kathmandu Ring Road where SAR teams were retrieving bodies from a collapsed building. Walking alongside the APF to deliver much needed body bags to a devastated site at Gonga Bu area, to prevent stench, spread of diseases and further trauma to other survivors. The quick sharing of first-hand information is critical in helping other incoming aid organisations make informed decisions when sending humanitarian assistance into the affected areas. This would ensure that aid brought into Nepal are appropriate to the prevailing needs of the victims and effectively reach the intended recipients. (left) Senior Correspondent Steven Clark of Mediacorp’s Channel News Asia (CNA), provided ‘live’ reports based on the SEED team’s ground evaluation. CNA has a broadcast coverage of over 24 countries and territories. (right) With the limited capacity of Kathmandu Airport, it is critical that aid agencies and help groups prioritise on bringing in key survival essentials to avoid unnecessary congestion and strain on the airport system. The SEED team returned to Singapore on Friday, with more aid arranged by the CCF and its partners to be personally delivered to Nepal over the next few days.